I worked for many years in a veterinary clinic in Albany, Oregon. 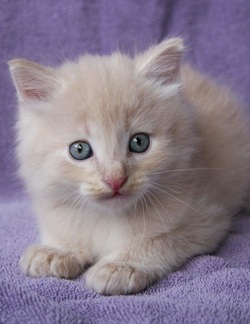 My mission is to offer healthy , well socialized kittens that will be in the low allergen range. My children, the neighbor children and friends and I are all involved with raising the kittens. Grandma and Grandpa often help with socializing and kitten photos which require a lot of patience. My wonderful friends , Tom and Meredith Lundberg, of Lundberg Siberians, www.lundbergsiberians.com are truly dedicated to the breed and have been saliva and fur testing and placing kittens successfully with new owners for many years.